April 2014 was the first time Coachella's installation artists saw their names printed on the festival's poster, alongside Outkast and Arcade Fire. But it also was the first year that each artist received an official policy notice via email telling them to remove their name from their work. Response was less than positive. The email came at a particularly inopportune moment: one week before the festival's opening, after most work was complete and artists were on site, setting up. Artist Patrick Shearn says: "You're out there, it's hot, you're working really hard, and you want acknowledgement and recognition for what you're doing, and I think the email was tactless and came out of nowhere. There was frustration around that." Organizers of the Coachella Valley Music and Arts Festival ? along with other fests such as the Electric Daisy Carnival ? have learned from art-heavy Burning Man the importance of a visual landscape to complement the aural one, so they've decided to place a greater emphasis on the "and Arts Festival" portion of the event's name. But as a result of the email and other slights, artists feel that, in many ways, Coachella treats them like second-class citizens. In earlier years, the now?15-year-old Coachella ? operated by promoter Goldenvoice ? gave artists little beyond a modest paycheck. While DJs and rock stars lounged in VIP splendor and festivalgoers frolicked at pool parties, installation artists ? categorized by the event as "vendors" ? toiled in the sun with crews who had to fend for themselves for basic amenities. They weren't even allowed to bring in their own water ? they had to buy it, at concertgoer prices. Jarico Reesce, who worked on earlier versions of the event with Cyclecide Bike Rodeo, a traveling carnival featuring a midway of pedal-powered rides, says, "Conditions were not great. There wasn't an artist camp ? we had to fight for that. They just stuck everybody in the parking lot." And buying their own drinking water got expensive. "We were out in the field sunup to sundown ? people were getting dehydrated," Reesce says. When Reesce spotted a faucet in a hedge, he brought a garden hose so his crew could take showers ? and take revenge on management. "When golf carts would go by, I'd hit them with the hose," he snickers. Like showering with a hose, name recognition was a struggle, too. Reesce recalls officials walking over and telling him to take down a "Cyclecide" sign on one occasion; he also says he had to kick and scream to get Cyclecide listed in the program. Even getting paid was tough: Contract terms made artists wait 90 days. So Reesce snuck past the VIP area into the accountant trailer to demand prompter payment. But over time, Reesce says, "They got wiser, and realized some of this art stuff has draw." As the festival grew in size and stature, things gradually improved for artists, who now have their own showers, plenty of port-o-potties and free drinking water. One artist reportedly was able to negotiate access to the event's commissary so that his crew could get food; other artists hope for similar privileges in the future. And, significantly, artists now see their names on posters and programs. But there's still room for improvement in areas small (the artist who asked for a copy of the poster and was told to buy one at the merch booth) and large (the "remove your name from your art" email). "They just sort of did a global thing that caused all of us to get upset," Shearn says of that email message. Shearn's group, Poetic Kinetics, created some of Coachella's most iconic art: last year's slow-moving snail sculpture, which traveled the polo fields, and this year's giant moving sculpture of an astronaut gazing down on Earthbound festivalgoers. "The whole issue of copyright and ownership and intellectual property hasn't been a focus of attention in years past. I think it maybe took Coachella by surprise." Recycling art from other festivals was, until relatively recently, Coachella's primary m.o. Reps from the festival would go to Burning Man, select a few pieces, then pay artists to bring those pieces to Coachella. 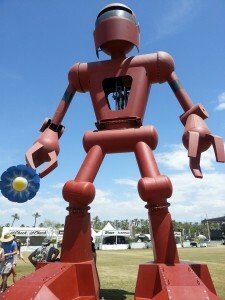 Recycling still happens at events with smaller budgets, but Coachella now demands first-run pieces that haven't been exhibited anywhere else. That's a significant shift from the early days of both festivals, when art projects often were a labor of love built in somebody's driveway, with the help of friends paid in beer, by an artist hungry for recognition and maybe a few free tickets to the show. Now, Shearn says, the projects are of a scale and quality that demand year-round endeavors, paid crews and serious budgets. Christian Ristow, creator of the large red robot sculpture Becoming Human, had already welded his name onto his work when the email came, and Ristow says removing and repainting it at that late hour would have been impossible. But Shearn's crew had to go into a last-minute scramble to have mission patches on their astronaut's spacesuit reprinted to comply with the request. Paul Clemente, Coachella's art director, bristles at the suggestion that Coachella's aim is to deny artists recognition. "This came up because an artist took it upon themselves to put their name, website and hashtag on all of their pieces of art," he says. "And it wasn't small. It was very obvious, and it detracted from what we sought to accomplish." He adds, "Everyone's name was on the poster, we put up an art web page, so it's not hard to find out whose art it is." Responding to the charge that the event's top concern is corporate branding, Clemente says, "I'm not going to lie to you, the priority is about Coachella. It's about what's best for the show." He explains the festival's obligation to maintain control over its image as a largely unbranded event while honoring existing agreements with entities, such as Heineken, to emphasize their signage. Overall, the organizers want an aesthetic with minimal signage, Clemente explains ? signs that point to bathrooms or to camp, but that's about it. On the polo grounds, however, vendor booths have signs, as does the large, air-conditioned Heineken outpost. Clemente also says Coachella's particular breed of partiers would damage any art-identifying placards. "Somebody's going to put a sticker over it, tag it. It's gonna get ripped in the middle of the night, gum stuck on it." "We're spending a lot of money," Clemente adds of Coachella's art. "And we need those artists. There's a very finite number of people that can work on the scale we need." Another artist who didn't want to be named, however, questions Coachella's commitment to supporting artists, who are routinely segregated from the event's higher-end areas. "We get very limited access," he says. "We have field passes, and that's it." The artist contrasted this policy with standard art-world practice, where museums and gallery owners make a concerted effort to introduce artists to collectors. "But the way Coachella does things is an anomaly," he says. "We're not allowed in VIP areas or backstage. We're not invited to parties, or the places potential collectors might be." Next year's contract, Clemente says, likely will include some changes ? more specifics about what artists can and can't do to promote their work for the fest. The flare-up seems to be a growing pain of an event forced to leave behind its freewheeling youth. "We're in the middle of an evolution," Shearn says. "They were maybe tactless in their delivery of this decision on the field this year. But I don't think they're the evil overlord. They're getting an education themselves."